Adam is our ABE Britain Team Evangelist! Following a period of evangelism training and mentoring by Alex he was invited to join the ABE team in February 2016. The training and mentoring are on-going but now Adam is part of the team! 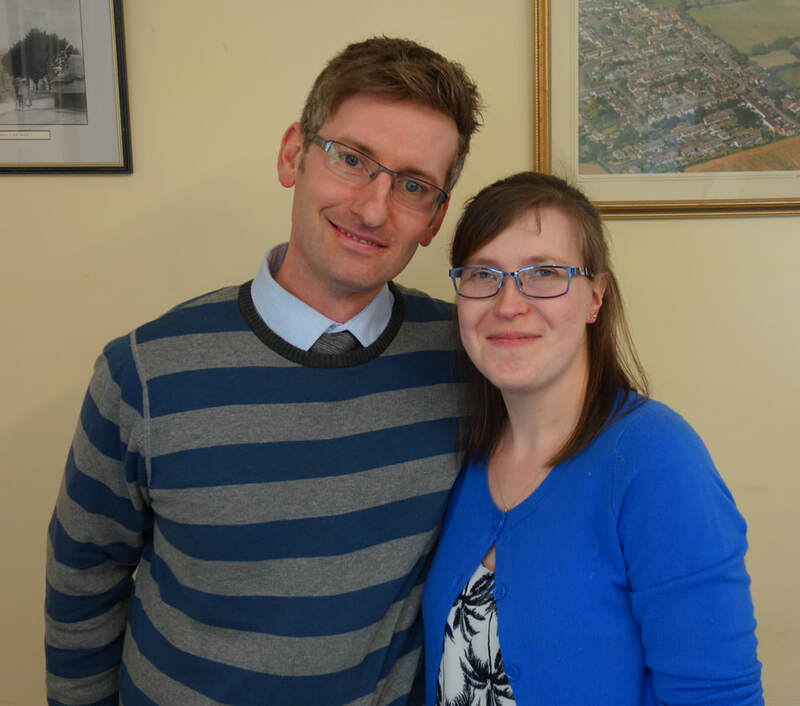 Adam, who is based in West Somerset, is married to Amanda and they have three children, Kimberly, Kayleigh and Samuel. Alex says "It's great to have Adam on the team. He has a passion to see people come to Jesus and loves God's word and believes in its power. I'm blessed to have such a man to help and support me in our great soul-winning task!" I grew up in a loving Christian family and went to church regularly, so I learnt a lot about Jesus and the Christian faith. While growing up my dad was poisoned from using sheep dip on the farm, known as organophosphate poisoning, the doctors said his brain would never function more than 25% again, but God had other plans and he made an 80 odd % recovery, I can’t remember ever going without anything through that time, we were always provided for. And I’m so thankful I have such strong Christian Parents. As a teenager I drifted away and wanted to do my own thing, I got into martial arts where I became a black belt and an instructor in Tae Kwon Do, I also studied aikido and others over the next 12 years or so, in this time I also had a rare opportunity to meet and have a training session with the Hollywood action star Jean Claude Van Damme, but so what!! All this just pulled me even further away from God, I realise now I made it an idol, but I always knew that there was something missing in my life. I met my fantastic wife, Amanda at school, who through meeting my parents became a Christian. Seeing the difference in her and listening to the song You Laid Aside Your Majesty at her baptism helped to lead me back, we got married in 2003 at St Michaels in Alcombe, as we wanted a church wedding, we attended that church for a while, and we had our two lovely daughters while going there. Kimberly our oldest had a difficult birth, her head and neck were injured during delivery, so there was worry of the effects it may have caused, but God had his hand on her and she is a very clever and talented girl. Her hearing was also healed through prayer just before needing an operation, and even though she couldn’t hear very well she has an amazing singing voice, which she has used to bless other people, and at the age of 11 she gave her life to Jesus and was baptised. Kayleigh is very clever and active (and a bit daring) a lot like I was when I was her age, I seem to hear an echo of my parents voice when I tell her to get down or to be careful, she is kind and helpful and is also showing a talent in music and sport, she is growing a strong faith in Jesus. I asked Jesus into my life in 2006 and started going to the Baptist church in 2007 in which time I helped Andrew and the Upcott team start up the boy’s only group (BOG). We moved to Lynton in 2008, we started going to the URC there where I helped to start up the worship group, some other youth activities, and a home group. It was also around this time God healed me from aggressive migraines, they were so bad I was taken into hospital twice with suspected stroke, and they were becoming more frequent. Some Christian friends laid hands on my head and prayed and I have not had one since 2008, praise the Lord. I also was baptised at Lee bay while living In Lynton. We moved back to Minehead in 2012 and started going back to MBC, around this time I started to struggle from some false teachings and cults as such, mainly from the internet, but through help and prayer from Amanda, family, friends including Andrew and Alex, and my own prayers I broke the chains Satan had on me and through the trial I am much stronger and more discerning. And have also learnt to hear God more, I used to wonder why I couldn’t hear Him with my ears, I know some people can, but I hear him more in my heart, I’ve learnt God is Spirit and he communicates through his Holy Spirit within us. In this time I have worked alongside Andy and Tim (Ministers) and others in different activities including Wow, the youth church, worship, Street Pastors and The Hub where we are outreaching to local families, And as you know I am now on the men’s ministry team helping to organise things for you guys and have now become team leader for the missionary team. In 2015 we had a son (Samuel), I wasn’t planning on having any more children, I was actually quite liking the freedom we were gaining as the girls were getting older, But Amanda wanted another child and God told me we were going to have a son, Amanda was given the name Samuel, (God has heard), not long after I knew Manda was pregnant so she did a test and she was, the second scan confirmed it was a boy, although I had already told many people we were having a boy. The scan also showed up some light patches and the midwives didn’t know what they were but I believe it was the Holy Spirit's light. Samuel was also born 4 days early which landed on Easter day. Although the birth was expected to be quick, 8 hours later we realised something wasn’t right, he was in the wrong position, the midwife went for the doctor, I had sudden panic and flash backs of Kimberly’s birth, anyway I pulled myself together and I said to myself “I’m not having this again” I put my hand on Manda’s tummy and prayed in the spirit, I literally saw Samuel change position and within no time he was born, and we came home the same day. I was on crutches at the time Samuel was born, as I had an accident where my dog ran into my legs and knocked me over, an x-ray showed I had over flexed the ligament which also caused the bone to chip, so I had to keep it strapped up. After receiving prayer I went back to the hospital where the doctor showed me the same x-ray and to my amazement the chip of bone was no longer there, (on the same x-ray I had seen a few days before??) The ligament also healed quickly, the physio couldn’t believe how fast I recovered! Samuel had an accident on Boxing Day 2017 where he pulled a cup of boiling water over his face, when in the hospital I was holding him and Praying, God told me he would be ok, it was upsetting to see how bad his face looked, but God is faithful and Samuel has been healed. A few years ago I had a call on my life to become an evangelist, I met international evangelist Alex Bowler, I felt led to ask for his help, February 2016 he asked me to join his team. I am also a member of the Fellowship of Evangelists. It is my hope to be able to become a full- time evangelist in the future in the work sense. I look back over my life and see all the amazing thing’s God has done for me and my family, all he has provided, all his grace and mercy (and patience) and how he has used us to bring other people to him, how he has given me an understanding and a love for the King James Bible, and how he is using me to evangelise to people, and with the help of my friend and mentor Alex I want to grow in confidence and help more people hear the gospel. I am so privileged to call Jesus my Lord and My Saviour, and I want to be obedient to him, but it is by his grace, and "In whom we have redemption through his blood, even the forgiveness of sins." Colossians 1:14 KJB, I am justified freely, I can take no credit for anything, To God be the Glory.